WHERE CAN I LEARN MORE ABOUT D3? Our ultimate aim is to provide a comprehensive and current bibliography that is categorised according to D3 type and cross-searchable by a broad range of subtopics. The ensuing database should be useful for researchers, practitioners, public health workers and the savvy public alike. To make a start, the Molar Hypomineralisation category is presented below as a simple chronological list. This approach reveals a modest but growing interest from the scientific community in terms of annual publication rate, as graphed below. To capture articles regarded as primary reading for the field, the basic inclusion criteria were PubMed-indexed papers containing variations on "Molar Hypomineralisation" or "Demarcated Opacities" (usually in context of Molars) in the abstract or title. 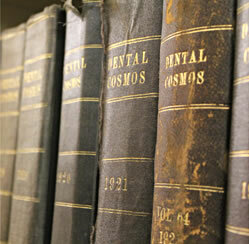 Necessarily, the rules were bent at times to include older terms (e.g. 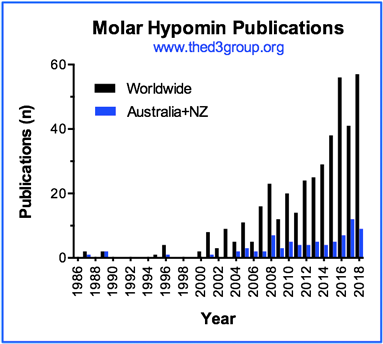 cheese molars), important lab-based studies on enamel hypomineralisation, and papers with particular relevance to Australia and New Zealand (papers from D3G members are highlighted in blue). Papers from journals that are peer-reviewed and accessible online (but not indexed in PubMed) may also be included. 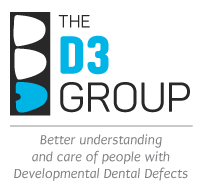 We recognise the need to cover additional D3s plus fringe areas that overlap the various D3 types. So please let us know about articles you feel should be included in the Molar Hypomin list, and also closely aligned categories that should be prioritised next. As of 2017, international plans are underway to prioritise amelogenesis imperfecta – interested parties should contact Mike Hubbard please. For those unable to access the full articles through their institutions, we suggest you contact the lead (corresponding) authors and ask for a copy. You can usually obtain their contact information by following the PubMed link to the Publisher website (where available) or by searching the internet for Author + Current institution. Please contact D3G if you have trouble finding authors' contact details.